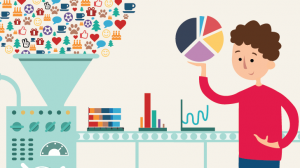 Data analytics isn’t just for the big boys any more. Data seems to be getting a bad press these days. GDPR causing panic and annoyance, yet another data breach here, or a misuse of personal data there. A lot of this change, media coverage and personal exploitation is because we, the public, have started to realise just how valuable data is. But data has always been incredibly valuable and, unlike most other commodities, the more there is available the more valuable it becomes. This is especially true to businesses that want to make reliable and informed decisions to help them grow. And decisions made without data are really no more than opinions and intuition. Large companies have been using data analytics for a long time but recent trends show that more Small and Medium sized companies are keen to use data too, gaining a better insight into business performance. A recent survey carried out by international business intelligence software provider, SAP, indicated that 73% of SME businesses surveyed were expecting to invest in data analytics in 2018/19. The major stumbling blocks for analytics are usually cost and expertise, which is why many companies are turning to outside experts such as DataConsulting to advise on processes and create valuable reports that can be repeated in-house. DataConsulting is a Wakefield based consultancy that has been working with FTSE100 companies, government agencies and local SMEs for over 10 years. DataConsulting specialises in providing, consultancy, training and bespoke analytic development using a variety of tools that suit a clients’ specific needs and resources. Operating predominantly on a Consulting as a Service model (CONaaS), customers appreciate that they don’t need to invest in software and can just benefit from the results. Customers want business outcomes and the CONaaS model allows them either to have work completed on demand or to just buy specific outcomes when they want it. Customer relationships using this method tend to be longer term and involve short bouts of work that customers can turn to when they need, perfect for the digital world. Popular analysis areas include IT, Finance, Sales & Marketing, Risk, Manufacture and Logistics., but anywhere there is data can be analysed and reported on. At a board level, reports and dashboards can give a real time view of company performance, allowing the management team to confidently make informed decisions. 1. Provides answers to critical business questions quickly. 4. Identifies cost saving areas. 5. Provides SMEs with more accurate client profiles. 6. Facilitates easier cooperation and collaboration. Because of DataConsulting’s size and flexibility it can offer the skills of a Big 4 accountancy firm at a fraction of the cost and with a much more personal service. Data insight is essential to every company and DataConsulting continues to work hard for all clients to make data insight a reality.